You know those weeknights when you need dinner on the table quickly, but you also want something a little different? 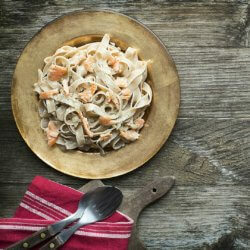 Creamy, dreamy No Name Salmon fettuccine alfredo is for you! Cook or grill your No Name Salmon fillets according to package directions. While salmon is cooking, cook your fettuccine pasta until just tender. Use your favorite jarred alfredo sauce to coat the pasta and break salmon into bite-sized pieces using two forks. Add the salmon to the pasta and sauce. Serve alongside a simple green salad and you’ve got a fast and filling meal that also happens to be a crowd-pleaser!